Way back in January 2005 a group of us trekked to the 100 Club in London to see The Go! Team live. I’d just read some article on Londonist about a band called The Pipettes who were supporting the band so it seemed worth going early. Well since then I’ve written about them loads and go on about them to anyone who’d listen, as well as seeing them live about 15 times. Finally, after 2 proper single releases on Memphis Records, an album release date (July 18) has been announced! The band have just put two finished album versions of tracks up on their myspace page and it’s well worth a listen. A far cry away from their live lo-fi sound, future single Pull Shapes reveals a lush, stringy, full sound and sounds better than you could ever imagine. They’ve gone from being a cute almost school stage performance to being a real sit up and notice wow band to more than just us dedicated few. Check out their songs, and see them live, they put on a superb performance. 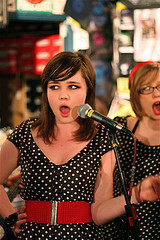 Photo taken from Music Like Dirt’s flickr stream.